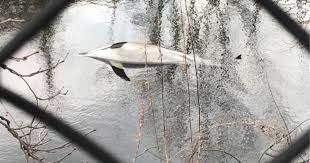 A dolphin was found dead in the waters of the Hutch on Friday. The body was seen floating near Glover Park in a section of the river between Pelham and Mt. Vernon that is heavily industrialized and polluted. The issue of raw sewage draining into the Hutch by the six municipalities along the river was just discussed at last Monday’s HRRP monthly meeting. The dolphin’s body was removed by County Police and turned over to the DEC for a necropsy on Saturday. The results haven’t been released yet. 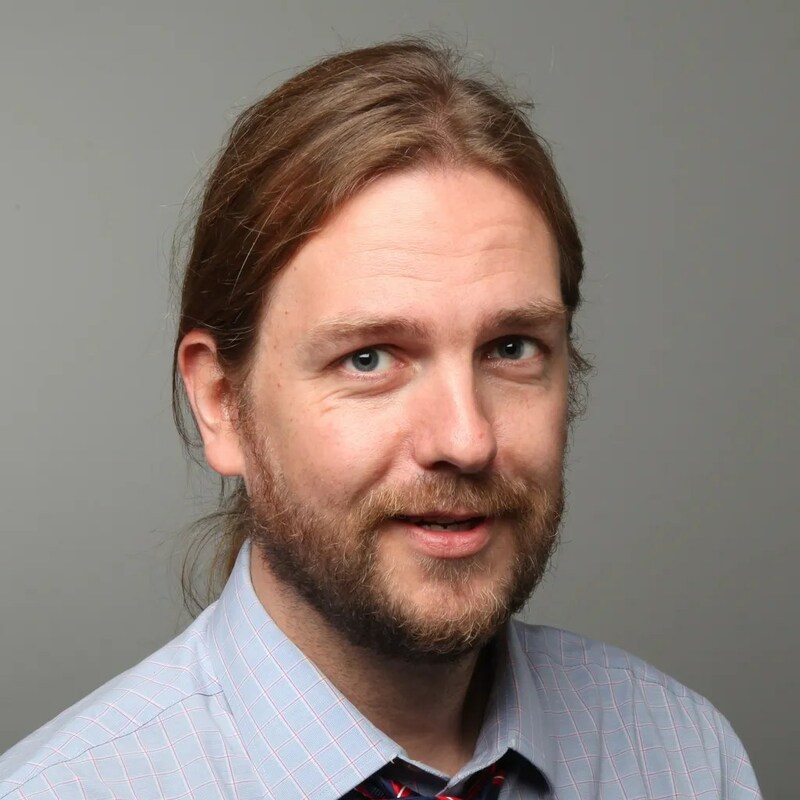 This tragedy serves to underscore the reasons for the formation of HRRP. The Hutch is considered to be the most polluted river in New York State. The efforts of HRRP are helping to make a difference but without cooperation — and funding — from the local municipalities, elected officials, and governmental agencies, our work is considerably more challenging. The Hutch runs through the Thomas Pell Wildlife Sanctuary, part of the last remaining salt marsh ecosystem in the Bronx. Our next Hutch Cleanup will take place in September, TBD. You can join us on Saturday, May 6th from 2-4pm for our annual Jane’s Walk to the top of the Pelham landfill for a spectacular view of the Hutch and surroundings. MOUNT VERNON – Credit curiosity. That’s what led my wife and me to wake up before dawn, tie our canoe to the roof of our car, drive down to Pelham Bay Park and carry a canoe across Shore Road, behind a bus stop, along an unmarked footpath and through the woods to a small, rocky beach on Eastchester Bay. From there, 77 minutes past sunrise and about an hour after high tide, we shoved off toward the mouth of the Hutchinson River. Our destination, that of every great explorer: As far as we could go. For Magellan, that turned out to be most of the way around the world. In our case, it was just beyond the Sandford Boulevard overpass in Mount Vernon, where we ran aground, ate a sandwich and turned around. The lower third of the Hutchinson River, our route, is, among other things, a polluted, industrial waterway with little public access. But it has its champions. Pelham Manor has a long-term plan to create a walkable greenway along its portion of the eastern bank. Mount Vernon has commissioned a study to explore potential uses for its riverfront territory. Farther south, from her home on City Island, Eleanor Rae has been leading the Hutchinson River Restoration Project. The Hutchinson River is about eight miles long and named not after the parkway that runs beside it, but for Anne Hutchinson, an early settler and religious pioneer. It surfaces from an underground spring near the New Rochelle and Scarsdale border, follows a viaduct beneath Jane Cammarata’s backyard and then re-emerges in a narrow culvert behind the homes on Forest Lane. “You get more wildlife, for sure, when you have a river in your backyard,” Cammarata said. 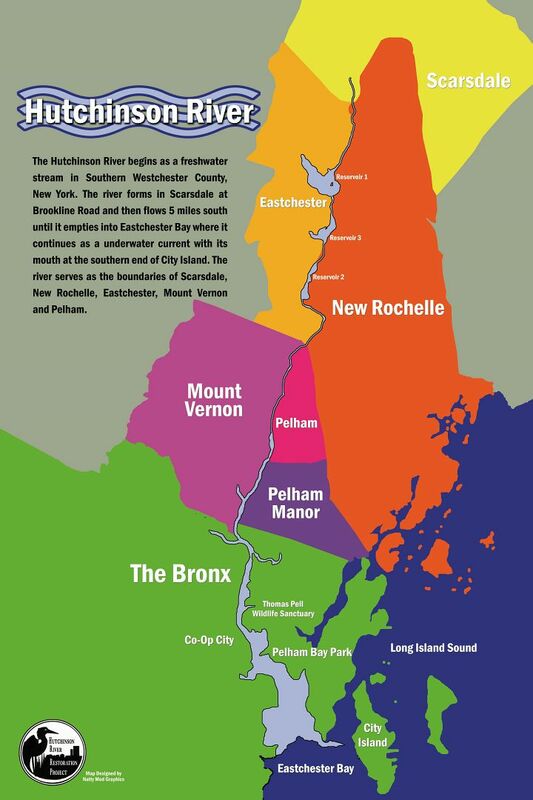 From Scarsdale, the river flows south, feeding a series of reservoirs that long ago stopped supplying the region’s drinking water. One former reservoir, known variously as Lake Isle and Lake Innisfree, is bordered by townhouses and a collection of co-op units. Residents swim and boat on the lake, essentially bathing in and playing on the Hutch. The river’s lower portion is navigable for about three miles, from Eastchester Bay into Mount Vernon. It took us about an hour and a half to travel up it, avoiding barges, irking geese and gawking at the scale of industry — car-crushers, cement plants, oil tanks — still quite active along the river’s banks. We threaded a gantlet of contrasts. Co-Op City’s towers loomed on one side, an egret waded among the reeds on the other. Farther north, a backhoe picked through a pile of scrap metal while, in the woods on the opposite bank, a makeshift tent billowed in the wind. Construction workers at the base of a bridge waved as we passed. A man sleeping beneath the ramp connecting the Hutchinson River Parkway to Sandford Boulevard raised his head and said hello as we glided by. The Hutch is a dirty river. Sewage still occasionally pours into it through CSOs, or combined sewer overflows. 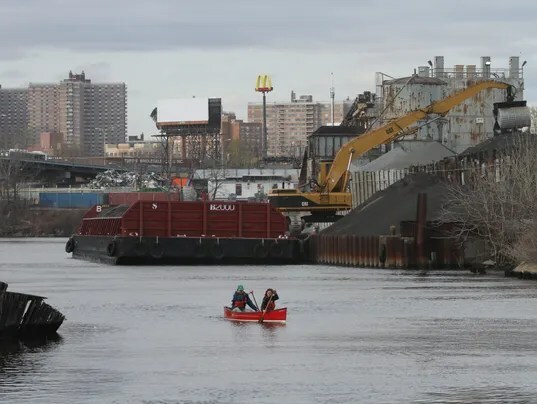 The state Department of Environmental Conservation says the river’s ability to support aquatic life and activities such as bathing and boating are “impaired” or “stressed.” The Bronx River earns similarly dismal marks. It remains busy with industry. The U.S. Army Corps of Engineers reports that 739,000 tons of cargo move through the river every year. By the corps’ count, 39 storage tanks hold nearly a quarter-million barrels of oil on the river’s banks. It was last dredged in 1989, though industry has been clamoring ever since to have the channel deepened. Not surprisingly, oil, grease and other industrial waste pollute the river. 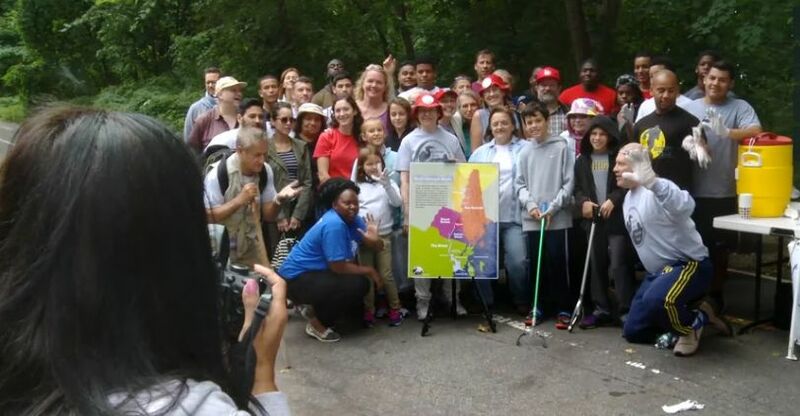 Its popularity isn’t helped when, during heavy rainstorms, it jumps its banks and floods the parkway, as it did May 1. Still, people care about it. He said the village is working with commercial and industrial property owners on the river to create a path that would trace the Hutch to the athletic fields. Eleanor Rae, founder and president of the Hutchinson River Restoration Project. Mount Vernon Mayor Ernest Davis said he envisions riverside restaurants and parks. Eleanor Rae and the Hutchinson River Restoration Project continue their work, leading cleanups of the river and its banks; pleading with local governments to devote resources toward improving its health; advocating for increased public access. 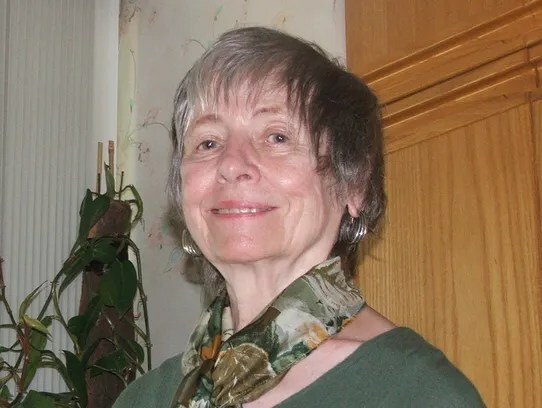 When she has time, she cruises the river and Eastchester Bay in her skiff, the Anne Hutchinson, whose life inspired Rae’s interest in the river. At the end of April, accompanied by a pack of teens and other members of the organization, Rae helped yank invasive plants from the river’s banks in Pelham. 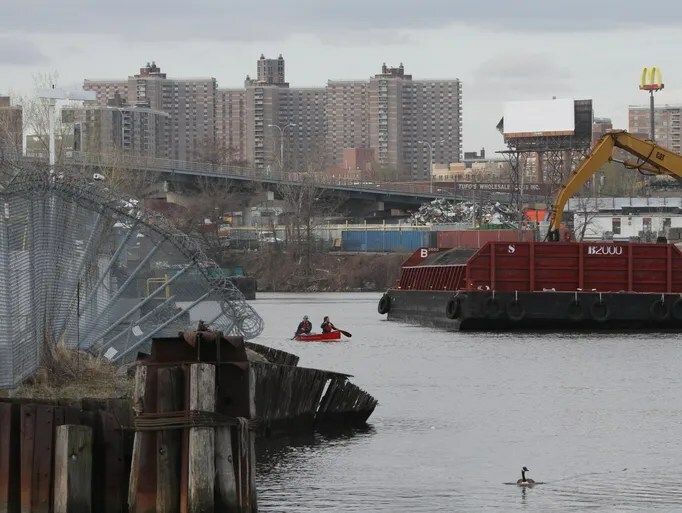 The New York City Department of Environmental Protection is now developing plans to reduce the amount of stormwater and sewage spilling into its waterways, including the Hutch. On our paddle, my wife and I spotted egrets, geese, red-winged blackbirds, cormorants and countless gulls. At times the air smelled of seawater, other times of heating oil. As we passed beneath Sandford Boulevard, the cement underside of the span close enough for me to run my hand along, our boat got stuck on a submerged, broken toilet. A moment later, we were standing on a sandbar, surrounded by lush vegetation, accompanied by the hum of traffic on the parkway and the officious honk of a lone goose wading upstream. We climbed into our boat and let the current and the outgoing tide carry us back down to the Bronx, the Hutch’s waters sparkling in the morning sun.